Ripon is famed for its choir stalls and misericords, dating from between c.1489 and 1494. Three hands from the workshop of the Bromflet family can be detected in these masterpieces of the carvers’ art. 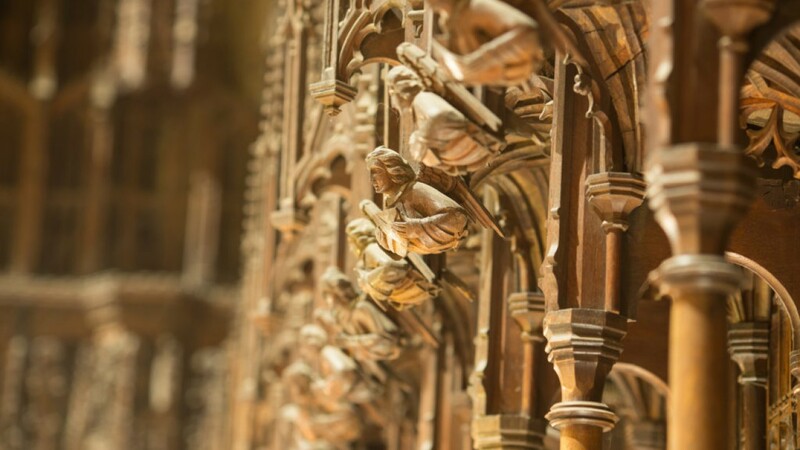 With a host of angels in wood above them, the medieval worshipper, made weary by the tasks of the day, could stand and yet rest himself on the ledge below the seat (- the misericord, a mercy seat). Beneath the seat-ledge are wonderfully creative scenes superbly carved in wood, some of which later prompted the imagination of Lewis Carroll as he came to write about Alice in Wonderland. Here we find characters in the dress of the time, moralistic scenes, mythological creatures, and some biblical and doctrinal episodes. Above, on the end of the stalls, are also other striking carved figures, including an elephant and castle (filled with apostles!) and a monkey. 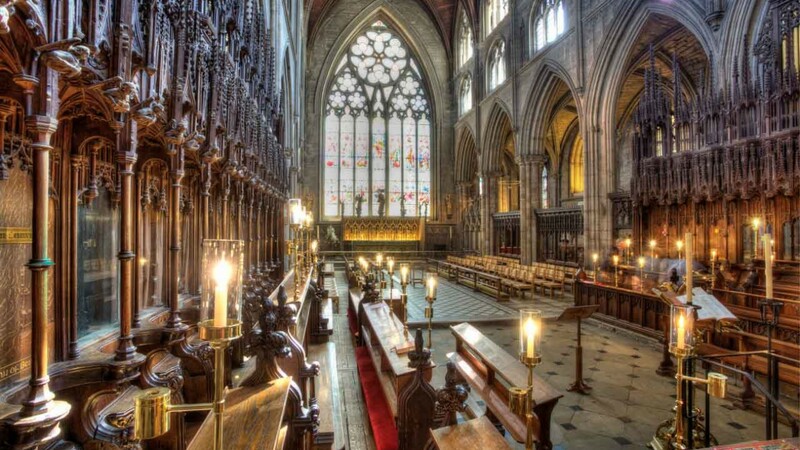 The father of the 19th century writer, Lewis Carroll, was a clergyman linked to Ripon Cathedral, a Canon. Some of the imaginative scenes in the choir stall misericords, – sometimes humorous, bizarre and satirical, – are said to have inspired Lewis Carroll when he came to write about Alice’s adventures in Wonderland. 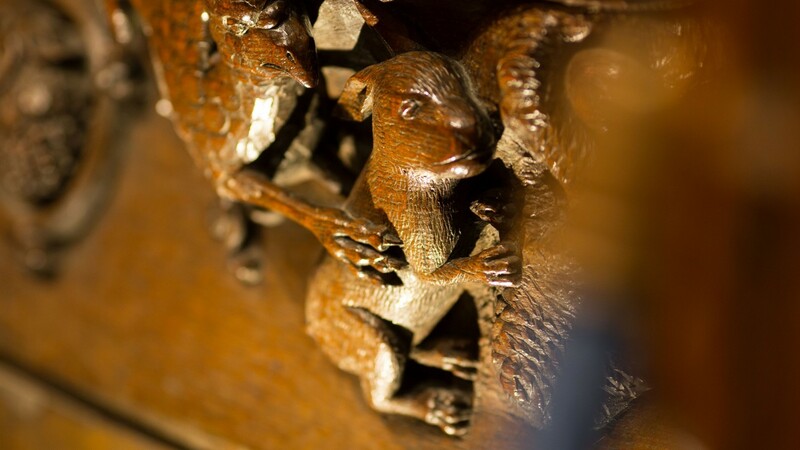 A rabbit disappearing down a rabbit-hole, a griffin, and figures with heads and bodies, but with no legs, are amongst the misericord features. A Cheshire cat feature is high up in the South transept (-do ask a blue-gowned guide to point it out to you). Born in Northumbria, Wilfrid took up the “religious” life whilst a teenager and studied in Lindisfarne, Canterbury and Gaul and at Rome. Then, in the 660s, the king granted him the monastery at Ripon, recently established by Celtic monks (whose members included the later famous St Cuthbert). Wilfrid replaced them with a new community following the Benedictine Rule — the first time it had been used in England. 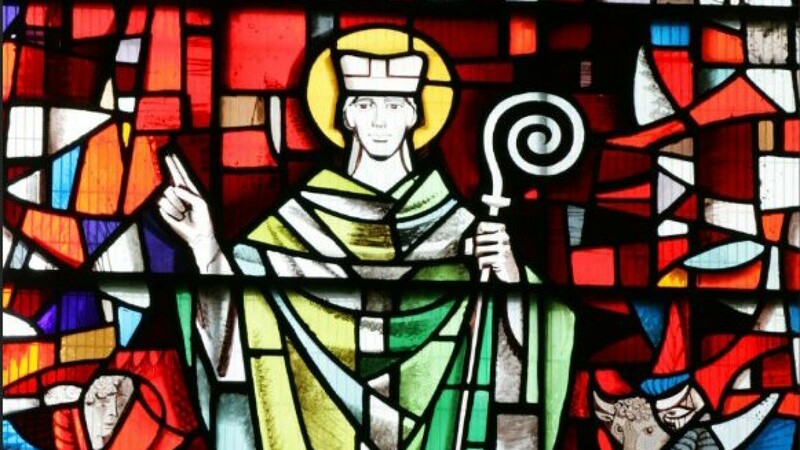 At the Synod of Whitby in 664 he persuaded the kingdom of Northumbria to choose Roman traditions over the Celtic. Later that year he became Bishop of the Northumbrians and from then on travelled tirelessly throughout England and on the continent, undertaking missionary work, advising kings, founding monasteries, building churches and beautifying their liturgy with music. On his death, he was buried in Ripon – in the beautiful stone church which he had founded here some forty years before, the crypt of which is still used today. We are fortunate to host some of the world’s best singers, musicians and orchestras at Ripon Cathedral. 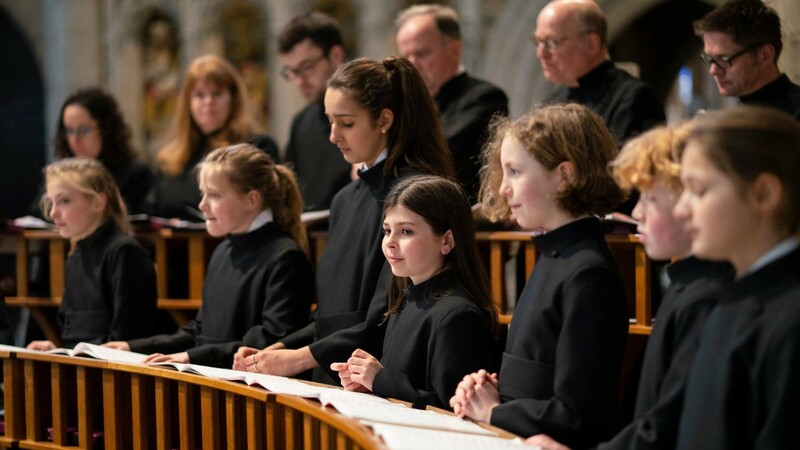 Most days you can enter the cathedral in the afternoon and hear the choir rehearsing from 4 onwards, or perhaps catch one of the orchestras on a Saturday ahead of big concerts in the evening. Every Thursday we also host a popular Lunchtime Concert Series which includes a free lunch and drink from 12.45 – 2pm. The wonderful medieval “Geometric” East window, “almost the length of a cricket pitch”, celebrates in stone the living and eternal God as the Trinity. The vibrant 19th century stained-glass portrays the risen Christ and his apostles. Below, the high altar is surrounded by the glittering, golden screen created by Sir Ninian Comper and were given in tribute to those to who lost their lives in World War 1. The many gold figures recall the story of the Christian faith and hope coming to the North of England from both Celtic and Roman Christian traditions. The figures above celebrate the triumph of life over death and of good over evil, with the youthful, beardless, risen Christ perhaps being a reference to the young men who lost their lives in World War 1.